The problem is that the TabControl do this in an event handler of the ItemContainerGenerator’s StatusChanged event. This subscription is made in the OnInitialized method. This one is marked as protected and virtual so I could override it to do nothing but if had do so I would have loose all the work done in the base class of the TabControl which is Selector. 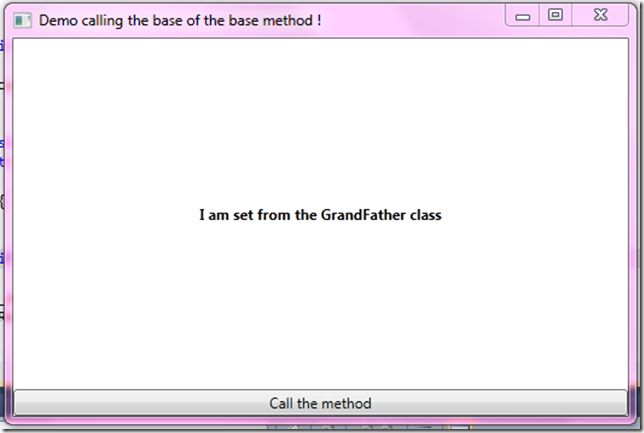 So I needed to be able to call the Selector base method and skip the one of the TabControl. Unfortunately you can’t access to a method base class of the base class of your current instance. In this post we’ll see how it can be performed anyway via a tricky technique. Truth to be told, I found this solution on stack overflow and I found it so neat that I needed to share it with you ! Note: the title may be rephrased to “How to skip an override in a method inheritance path”. Edit: thanks to Thomas Levesque there is now two solutions presented here ! Let’s say that we have three classes : GrandFather, Father and Child. 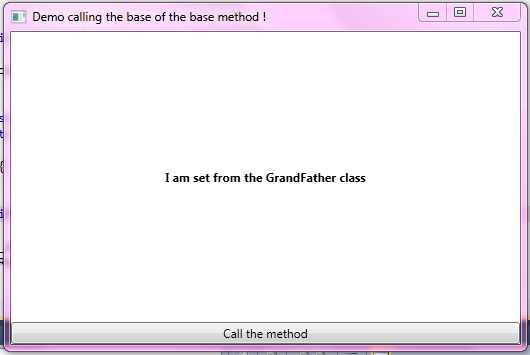 It works like a charm but in our case, what we actually need is to call base.base.MyMethod() but this is not possible in C#. We use reflection to set an undocumented field on the Delegate class which can disapear in the next version of the framework. Be sure to notice that this is the Call operator which is used instead of the CallVirt which would have result in an infinte call loop. - it uses reflection (also bad for performance) on a non documented private field of the Delegate class. The implementation of this class could change in future versions, and this solution wouldn't work any more. Thank you for your comment and it works like a charm ! Btw, there is still reflection in your solution, the only difference is that we use 'this' as the current instance without recreating one.